Back at UH after their long term loan to the Houston Metropolitan Research Center, the collection documents the life and work of Joseph Cullinan, founder of the Texas Company and one of Houston’s most influential citizens. The papers of former Houston mayor Kathy Whitmire, the first woman elected to Houston City government, are now housed in the Women’s Archives. Founded in 1906 by some of the founding women residents of the Houston Heights, the records of this organization document civic, cultural and literary activities. UH student Alison Ward served as an intern in Special Collections this summer. She agreed to write a blog post about her experiences with us. Thanks to Alison and all our interns for their hard work! When I first heard about this internship opportunity, I was both intrigued and excited. I chose Special Collections because it proved to be a great occasion to discover whether or not library science was a plausible graduate degree for me to pursue. My internship began the first day of the Summer IV session, July 5-August 4, 2006. After meeting my supervisor Amelia Abreu, the Archivist/History librarian in this department, I began training for my main summer project. It consisted of updating departmental Finding Aids (documents that provide access to archival collections) to ensure consistency and accuracy. Over the next few days, Amelia did an excellent job explaining the importance of Finding Aids, as well as the new inputting requirements. The Finding Aids themselves first had to be transferred onto official Templates which include the following information: the name and dates of the collection, a detailed biography of the collector (if applicable), copyright information, a detailed description of the collection, and more. This description is divided by boxes and subdivided into folders, the entire contents of which are delineated. Librarians organize the boxes by topics such as correspondence, articles, scrapbooks, photographs, art, manuscripts, plays, and miscellaneous items. I completed over fifteen Literature Finding Aids files, some larger and more extensive than others, which included the Aldous Huxley Papers, Vassar Miller Papers, Kenneth Patchen, Fritz Leiber, and Sylvan Karchmer to name some prominent ones. As a culminating project for my internship, Ms. Abreu asked me to create my own Finding Aid for a rather important collection. This was a fantastic opportunity for me to call upon the skills that I had acquired while transferring ready-made documents onto official Templates. The designated collection was by William B. Shrimplin, an Ohio barber who was an avid collector of Mark Twain works. While making an itinerary, I discovered some priceless finds among this collection. There are letters written by prominent figures such as Jack London, James Whitcomb Riley, Carl Sandburg, and President Calvin Coolidge! He also owned two letters written by Samuel Clemens (Mark Twain) in 1891 and 1894. There were many other wonderful collections that I discovered while working in Special collections. For instance, Ms. Grob allowed me to touch an original copy of the King James Version Bible printed in 1611! There is a collection (Colonel Israel Shreves Revolutionary Papers) which contains letters by George Washington and Alexander Hamilton. Special Collections even owns a Sumerian cuneiform tablet. All of these artifacts fascinated me and made me all the more eager to learn about the documents and other items housed here. Many of the collections are one-of-a-kind; I was privileged to be able to record and handle these valuable documents, artifacts that connect one with the past. Whenever I held a letter by Mark Twain or the King James Bible, it gave me goose bumps to think that I was touching documents handled by people that I have only read about. That, I can honestly say, was the most rewarding experience that I had during my internship here in the Special Collections Department-the continuity of past in this present day and age. The National Agricultural Library has a fascinating online collection of 175 historic pomology watercolors from its Special Collections. Search by artist, or by fruit. 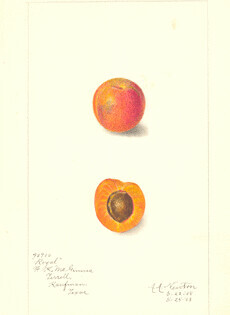 Image courtesy of National Agricultural Library, Agricultural Research Service, U. S. Department of Agriculture. 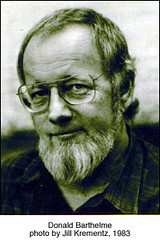 The Donald Barthelme Forum Collection finding aid is now available online on TARO. The collection covers Barthelme’s tenure as editor of Forum, from 1956-1960. Forum featured articles on a wide range of topics including philosophy, literary criticism, economics, anthropology, psychology, biology, mathematics, architecture, film, music, and theater.